So, Diane von Furstenburg is designing 20 rooms for Kate Moss's favorite hotel, the UK's Claridges, "bringing her unapologetically exuberant style to an Art Deco landmark. Three rooms have been completed so far — the others, each unique, will be done by the end of the year". I just love DVF. Always so smiley and happy looking. And let's face it, the woman sweats glamour. Read the full article here. Well? What do you think? OMG or OTT? For a hotel. Perfect. I think the fact it is all black and white works. And the whole point of a hotel is to transport you somewhere else. For my home? Giant headboard thing would freak me out. OMG. You can never be OTT in a hotel room. Surely that's what they're there for? 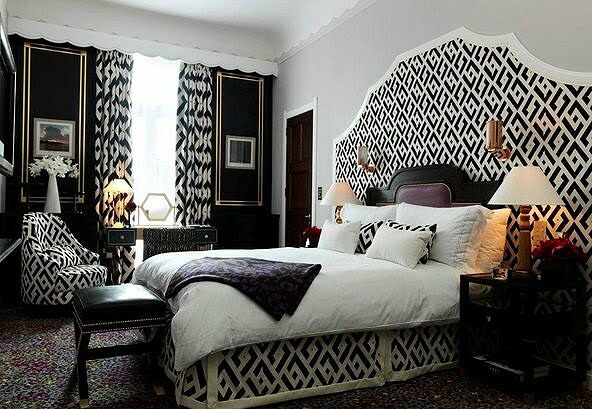 for a hotel i think its fabulous...hotel rooms need to be differnt otherwise whats the point? i love DVF...she's fabulous & very glam! Lovely to look at but don't think I could sleep there. BOTH! Sometimes I really like over the top. This hotel room is really working for me. I really like it. I don't think it's OTT at all. DVF is magnificent in all she does. NO doubt OMG! I love all this DVF and her style is always spot on! Hilary, OTT = "Over The Top"!